I'm not sure whether to celebrate or cry when I found out the go-live date for the project I'm on at work has been delayed. 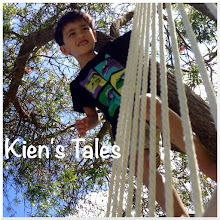 I re-read my About this site page over the weekend (I wrote it midway through 2010 when Kien was barely standing or talking), and it reminded me what the words "all new adventures - good times" actually means to me. It is good to jog one's memory of the important aspects of one's life, and not dwell too much on the hows and mechanisms by which we can afford our existence. Once upon a time my work/job/career was one of the most important aspects of who I was as an individual according to my perfectionist, Asian mien. Since Kien came along I've realised the person whom I expected myself to be, in a parallel universe where obligations and expectations are silenced. My life aspirations are pretty simplistic in reality, and I don't want to lose sight of them whilst getting swept up in the everyday. Yes, I use the word "everyday" as a noun rather than an adjective, and I haven't even bracketed or italicised this explanatory sentence either. Silly me (but I totally would present my argument to my English teacher at E.G.G.S. and I'm sure he would understand my point of view, before giving me a D-). Oh boy, this blog post isn't at all what I had intended, but since I'm in a chatty mood I'll tell you what happened at the supermarket this evening when I went and got some supplies. I got to the checkout counter and proceeded to empty my trolley onto the conveyer belt - roast chicken, vitality slaw mix, milk, beer, wine - and the lady asked to see some I.D. So I rummaged through my wallet and couldn't find my drivers license, and for a split second I felt like I did when I was 18, like, oh no, I can't find my I.D. and I'm not going to be able to convince them I'm actually of legal age! Luckily I found my license, and when she looked at it she let out a tiny chuckle. As I was swiping my Visa card she asked/commented, "What is your secret to having such a youthful looking face?" to which I replied "wow, do I really have such a youthful looking face?" - because, really, I don't feel youthful lately, and certainly didn't an hour before when my son fell asleep in my arms after sobbing profusely for half an hour. But thank-you, checkout lady, for thinking I look youthful - and my apologies for what must have sounded like a sarcastic retort. Kien's been though the wars today. Somehow he managed to cut his toe at playgroup. He took off his shoes and socks when we first got there this morning, and then went outside barefoot. One of the mothers brought him in bleeding, and the cut didn't seem to bother him when I washed it. 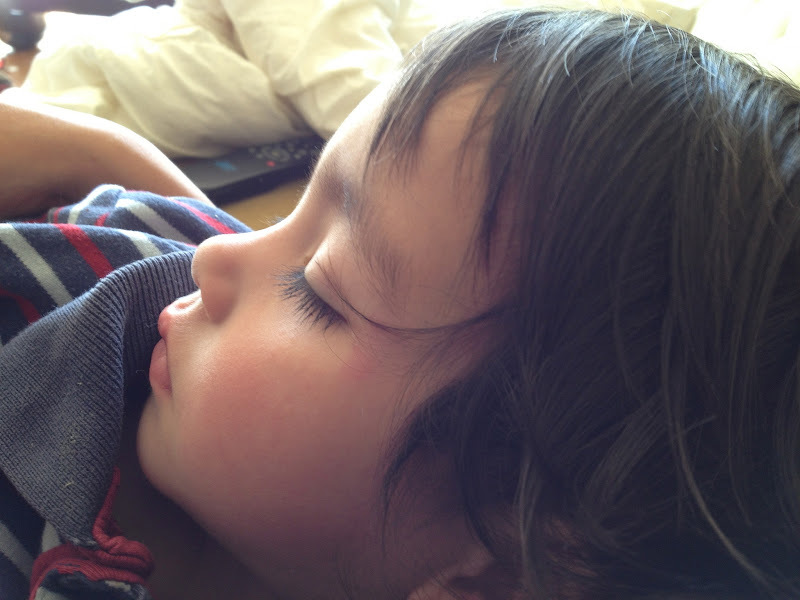 But this afternoon while he was playing he started to cry, and the cut certainly bothered him then. I cleaned his foot and put a plaster on it. He cried himself to sleep in my arms. Also at playgroup he ran into another kid and they bumped heads. Can you make out the bruise next to his eye? You know what else has dawned on me lately? How very little we cook and how often we choose to eat out. How does anyone fit in cooking after a long day at work? On Monday we went to our favorite yakitori place. 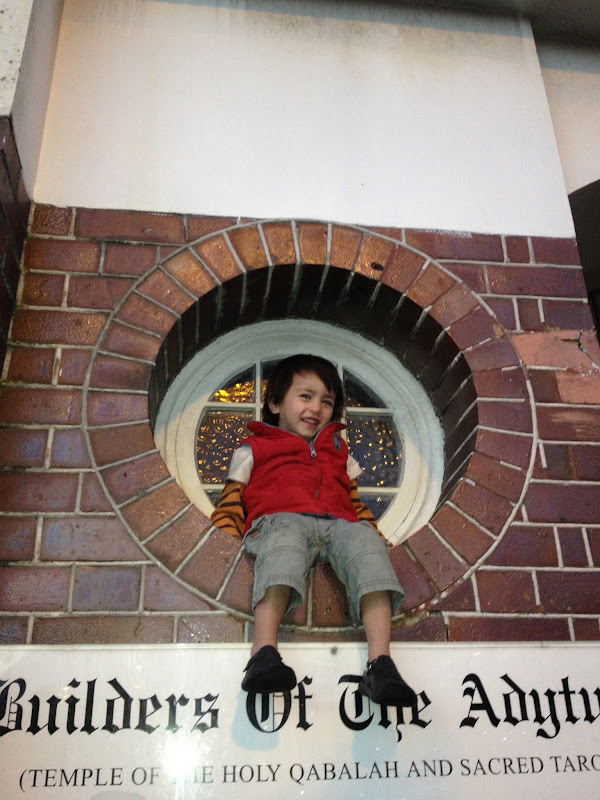 It's such a great place to go and enjoy yummy food, and we always have the trusty iPad as a babysitter for a bit. After dinner we walked through Myers Park on our journey home. Such an excellent way to spend an evening.